UNM's Clinical & Translational Science Center is guiding and accelerating health discoveries to improve lives in New Mexico's communities and throughout the Mountain West. 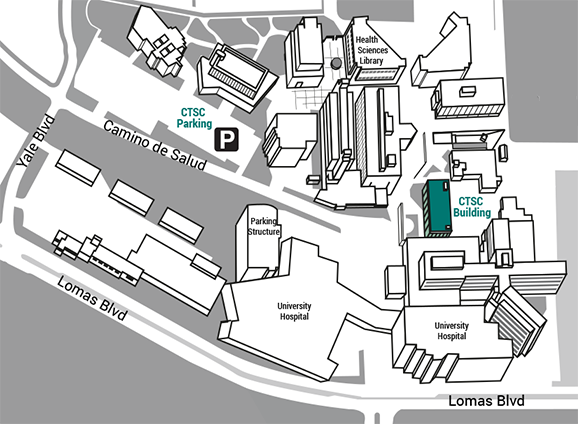 Visitors to the CTSC Building should enter through Lomas Blvd, turning north onto Yale Blvd. Proceed to the roundabout and veer to the right (east) onto Camino de Salud. Proceed to the UNM Hospital Patient Parking lot. CTSC reserved parking spots are located on the Southeast corner. (If the reserved spots are not available at the time of your visit, any available spots in the general parking area may be used).